I can't get the video for this Ryan Zimmerman home run to work in Opera 29, or other video on the Washington Nationals Website. I tried the User-Agent switcher extension and it didn't help. I even set it for Firefox because I had no problem getting the video to play in Firefox. YouTube and other video sites are working for me fine in Opera 29. 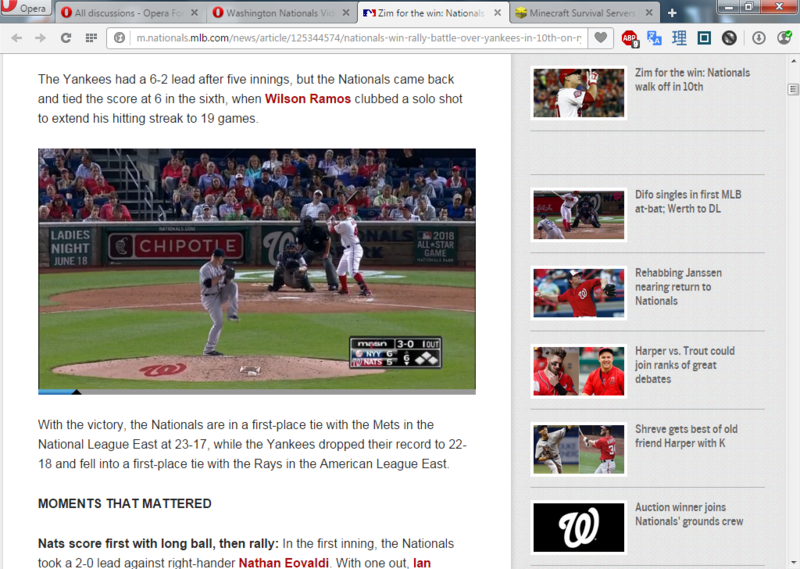 Anyone have an idea why there's a problem with the Washington Nationals website in Opera 29. I'm not just making this up. I had a massive issue with Imgur earlier on because StopSocial actually blocked Imgur features for me while I had no idea it was doing that (I learned soon enough). One idea though: do your Youtube video's start automatically (as in: click a link, the video window shows and you only need to click start) or does it require you to click "enable flash media player" (no literal quote)? The latter also applied to me until I noticed an update for the flash plugin. After that update things worked normal for me, including the Youtube video's. SO, you might want to go to your Extensions section and click "updates". Fixed. Thanks. A few days ago I did a system restore that went back a couple weeks, and I must have lost my adobe update. It was kind of tricky to get it back. Not sure why. One goes to the adobe website in the Opera browser, but I must have done something wrong the first few times. Anyway, got it now, and the website works fine.